Our monthly Market Day is an ever-popular family event, held on the last Sunday of every month from April to November. The Tanks Markets are a unique slice of cultural life in the tropics, with a blend of market stalls, free live music and gallery exhibitions. The Kids’ Tank arts workshops are a fun part of market day, offering children the opportunity to learn anything from how to write a short story to printmaking..
Tanks is also home to annual family events that are eagerly anticipated within the community. 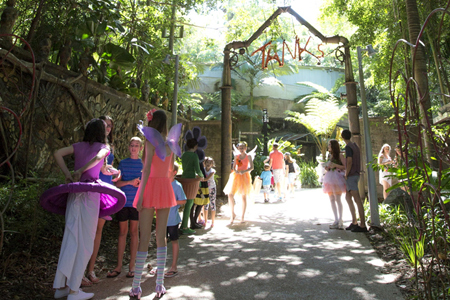 The Cairns Children’s Festival in May is a dedicated and diverse one-day program to celebrate and support creativity, adventure and innovation for children and their families, and Carnival on Collins in September offers loads of free family fun as a signature event of Cairns Festival.